Blackpool FC’s new board is hoping the EFL will make a decision on the potential 12-point deduction within the next 48 hours. This was revealed at Wednesday's fans’ forum at Bloomfield Road, where consultant to the board Michael Bolingbroke reiterated his hope the club would avoid the sanction. The club has now provided the EFL with all of the information it needs, but it was claimed there is no guarantee a decision will be made this week. “It’s now in their hands and they must do what they must do,” Bolingbroke said. “It will also help with new owners. The more vibrant the club feels, the more bouncy and together it is, the more people there will be thinking they want to take this club forward. It was also revealed over 50 potential bidders have expressed an interest in buying the football club. 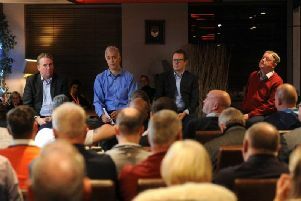 A number of other issues were discussed with the club’s new board, including stadium configuration, ticket prices and the Bloomfield Road pitch, which will be re-laid this summer once the rugby league’s Summer Bash finishes on May 19.